Ray Stachelek has been fishing the waters from Watch Hill, RI to Cape Cod MA for nearly fifty years. He is a presenter at the National Fishing Shows along the East Coast. He contributes articals to various national magazines. Writes fish reports for online and newspaper publications. Ray holds a Coast Guard certified captains license. A retired teacher by trade, Ray shares his knowledge readily and can help new anglers in the areas of fly selection, fly presentation, and casting. He has an innate sense of where the fish hold and can help all anglers of all skill levels "read" the water better. Experienced fly fishers will benefit from Ray's ability to match skill level with varying degrees of angling challenge. 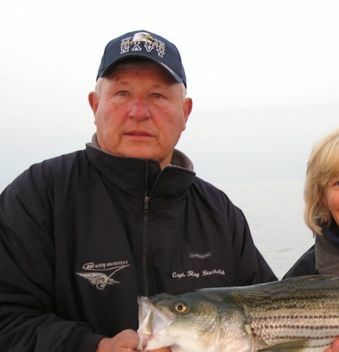 Whether you're looking for your first striper or your first slam, Ray is up to the task. "Every charter is different," says Ray. "Solving the puzzle with a different set of unknowns each day is a challenge I welcome. That and meeting new people have made chartering very rewarding. I enjoy watching fly fishers catch fish; sharing in their experience is awesome."